Pro-statehood supporters await the arrival of Puerto Rico's new governor at the seaside Capitol in San Juan, Puerto Rico, Monday, Jan. 2, 2017. Ricardo Rossello was sworn in Monday as the U.S. territory prepares for what many believe will be new austerity measures and a renewed push for statehood to haul the island out of a deep economic crisis. SAN JUAN, PUERTO RICO (AP) — Puerto Rico's new governor was sworn in Monday, promising an immediate push for statehood in a territory facing a deep economic crisis. Gov. Ricardo Rossello, 37, proposed several measures aimed at alleviating the crisis shortly after he was sworn in at midnight. Among them is a proposal to hold a referendum that would ask voters whether they prefer statehood or independence. Many have argued that Puerto Rico's political status has contributed to its decade-long crisis that has prompted more than 200,000 people to flee to the U.S. mainland in recent years. "The United States cannot pretend to be a model of democracy for the world while it discriminates against 3.5 million of its citizens in Puerto Rico, depriving them of their right to political, social and economic equality under the U.S. flag," Rossello said in his inaugural speech, delivered in Spanish. "There is no way to overcome Puerto Rico's crisis given its colonial condition." 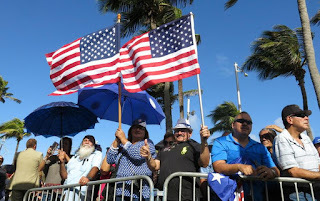 The crowd rose to its feet and cheered as Rossello announced that he would fly to Washington, D.C., Monday to back a bill to admit Puerto Rico as the 51st state. He also said he would soon hold elections to choose two senators and five representatives to Congress and send them to Washington to demand statehood, a strategy used by Tennessee to join the union in the 18th century. The U.S. government has final say on whether Puerto Rico can become a state. Rossello said he also aims to boost public-private partnerships and use that revenue to save a retirement system that faces a $40 billion deficit and is expected to collapse in less than a year. He pledged to work closely with a federal control board that U.S. Congress created last year to oversee Puerto Rico's finances, and he has said he supports negotiations with creditors to help restructure a public debt of nearly $70 billion. "Puerto Rico's recovery begins today," said Rossello, a scientist with no political experience and the son of a former governor who also sought statehood for Puerto Rico. Rossello announced that he has already signed six executive orders, including one to promote bilingual education, another to provide female government employees with the same pay as their male counterparts, and a third ordering agencies to reduce their budgets and contracts for professional services by 10 percent. He also seeks to privatize services such as the generation of energy, establish an office to oversee and distribute federal funds to cut down on corruption, and to create financial incentives for doctors to boost the number of dwindling specialists. Thousands of supporters cheered as they clutched umbrellas to protect themselves from a searing sun. "This is a historic moment for Puerto Rico," said 50-year-old Jose Davila as he waved a large flag from Rossello's pro-statehood New Progressive Party. "He's the hope of our island, he's the hope for statehood, he's the hope for a people that have suffered." Puerto Ricans have been hit with dozens of new taxes in the past four years and increases in utility bills as former Gov. Alejandro Garcia Padilla aimed to generate more revenue for a government he said was running out of money. Despite those and other measures, the island's government has defaulted on millions of dollars' worth of bond payments and declared a state of emergency at several agencies. The federal control board has requested a revised fiscal plan that has to be approved by end of January, saying that the one Garcia submitted last year was in part unrealistic and relied too heavily on federal funds. Garcia had refused to submit a revised plan to include austerity measures. Rossello has said he would request an extension of that deadline as well as an extension of a moratorium that expires in February and currently protects Puerto Rico from lawsuits filed by angered creditors. As supporters streamed early on Monday toward the Capitol building, one yelled out, "Today, a new Puerto Rico begins!" to the cheers of others, including those holding U.S. flags.